During a three-hour meeting in Paris on Tuesday, Russian Foreign Minister Sergei Lavrov and U.S. Secretary of State John Kerry discussed cooperation against ISIS in Iraq and Syria as well as the political crisis in Ukraine. After the talks, Lavrov said that the meeting had been useful, despite the refusal of the U.S. to discuss the lifting of sanctions against Russia. In the view of Russian experts, the general tone of the discussion was reservedly constructive, and the takeaway from the meeting is that while Russia and the United States must eventually settle their disagreements, for the moment they must concentrate their mutual efforts on the places where their positions converge. Moscow and Washington agreed to increase the exchange of intelligence to better confront the threat of ISIS, which has seized territory in both Iraq and Syria. 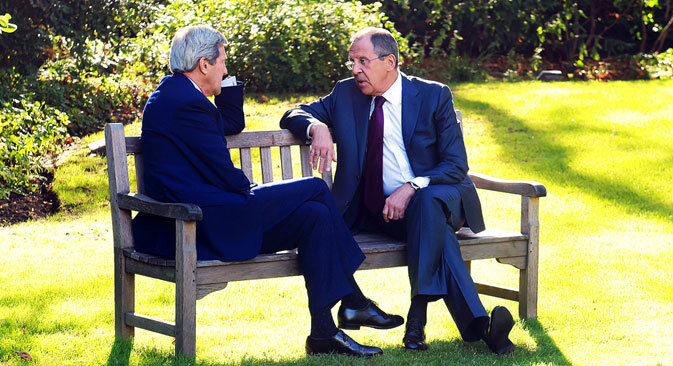 Kerry, citing Lavrov, said that about 500 Russian citizens are currently fighting within the ranks of ISIS. According to military expert Dmitry Litovkin, Russia and the U.S. are likely to use the same format of cooperation fighting ISIS that they used at the beginning of NATO's operation in Afghanistan in 2001. "The two countries' intelligence services were fully interactive in confronting the Taliban starting in 2001 and in the case of ISIS it will be very similar," said Litovkin. "Russia had an intelligence center in Syria that carried out radio-electronic interception of terrorist organizations' messages in the region and now Russia and the U.S. will exchange information on the positions of ISIS militias." According to Litovkin, given the changes in the U.S.-Russia relationship since 2001, it is too early to expect more significant cooperation, even in the fight against a common threat. "The lifting of sanctions will substantially increase Russia's reconnaissance and its assistance in the fight against ISIS," Litovkin said. On the eve of the Paris meeting, Russian media sources reported that Kerry’s main goals would be to convince Moscow to pressure the pro-autonomy forces in southeastern Ukraine to give Kiev several border checkpoints, and to persuade Syrian leader Bashar Assad to step down. "However, there were no announcements to that effect after the meeting," said Fyodor Luykanov, head of the Foreign and Defense Policy Council, an independent body that works to influence Russian foreign policy. "I believe that the Obama Administration is unlikely be able to change the course of events and the perception of its foreign policy within American society in the time remaining before the midterm congressional elections. The picture that has emerged is rather unfavorable for the U.S. president: in the eyes of the establishment, he does not seem hard enough on Moscow." In Lukyanov's opinion, the principal objective of the talks was "supporting mutual contacts and dialogue to solve urgent world policy problems." "The most frightening thing now is to lose contact, since this can lead to the loss of the thread of actions and interests that both countries are demonstrating to solve questions of international security," said Lukyanov. "There are still no serious agreements between the U.S. and Russia, and there will be none." Moscow's desire to renew cooperation with Washington was also reiterated by Russian Prime Minister Dmitry Medvedev in an interview with U.S. TV channel CNBC. According to Medvedev, the sanctions imposed on Russia caused damage for both Russia and the U.S., but, he added, talking about any kind of reset in relations without first lifting the sanctions is impossible at this stage. “Let's be frank: we were not the ones to create these sanctions,” Medvedev said. “Our partners in the international community created them. In Russia, we say God will be the judge. I do not doubt that sooner or later these sanctions will disappear completely. But the damage they did to our relations is very clear."